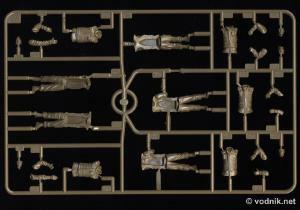 JGSDF (Japanese Ground Self Defense Forces) Iraq Humanitarian Assistance Team figure set is a new release from Tamiya - designed as an addition to their recently released JGSDF Light Armored Vehicle (LAV) kit. The set includes five standing figures, including one machine gunner for LAV. Figures wear uniforms and carry equipment typical for Japanese soldiers participating in Iraq humanitarian assistance operations. The set is packed in side opening box and contains two sprues of olive green plastic individually packed in plastic bags and a small decal sheet. 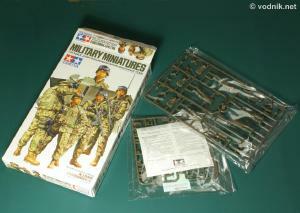 Assembly, decaling and painting instructions are provided on the back and on sides of the box. 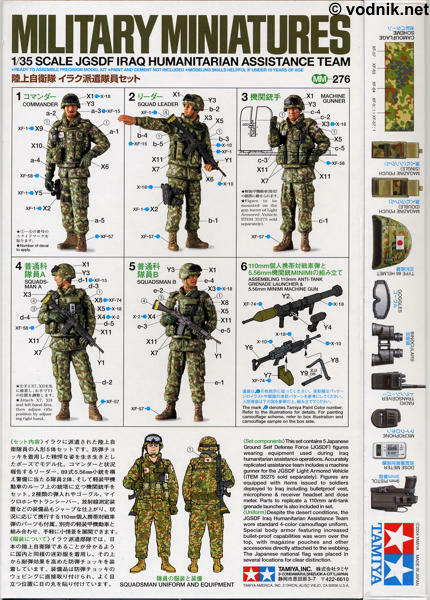 Painting Japanese uniform camouflage may be a real challenge and requires a lot of skills and patience to get accurate results. Assembly, painting and decaling instructions are on the box. - various personal equipment, like goggles, microphones, radio transceivers, dose meters, 9mm pistols in holsters, binoculars and ammo magazine pouches. 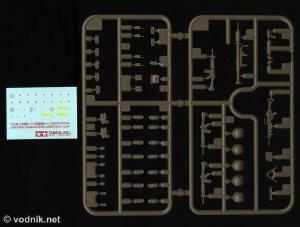 Decal sheet contains small Japanese flags for figure uniforms and three yellow stripe decals for Type 89 rifles. 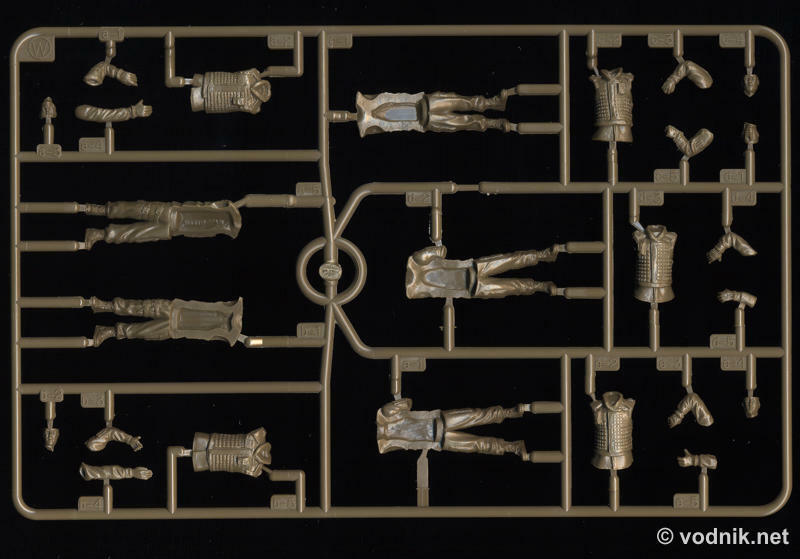 Sprue with all "body parts". 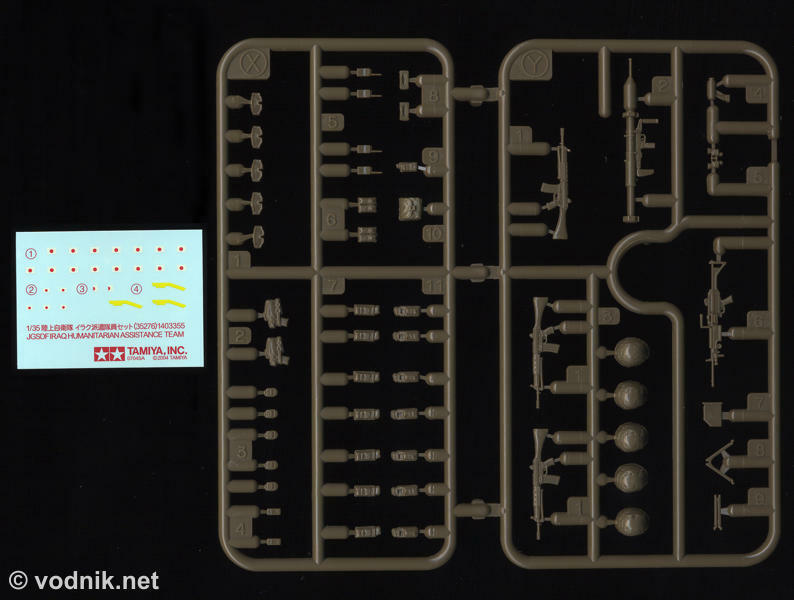 Decal sheet and a sprue with all weapons and equipment. Molding quality is very good with no flash and sink holes. There are small ejector pin marks on some parts, but nothing that could be considered a problem. 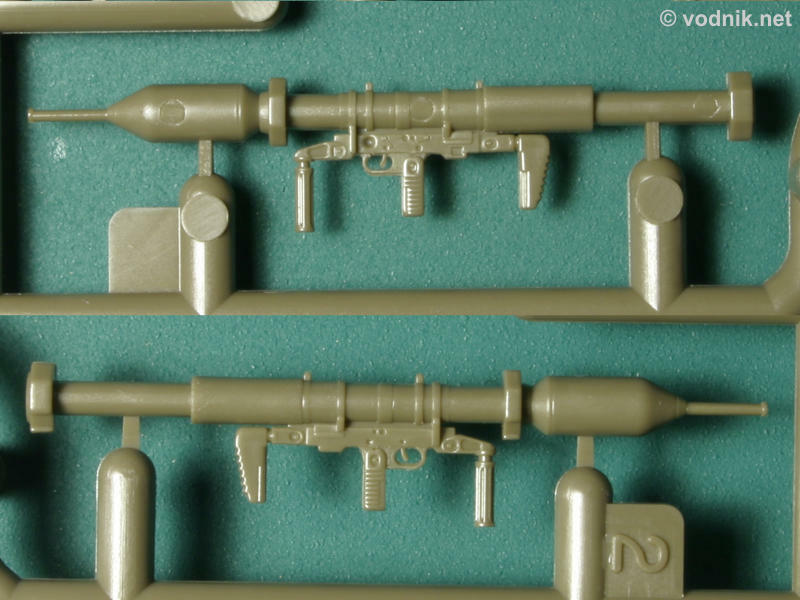 Details are crisp and particularly weapons look very good. 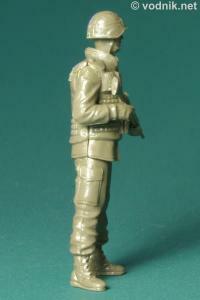 Facial details are well sculpted and have convincing Japanese features. 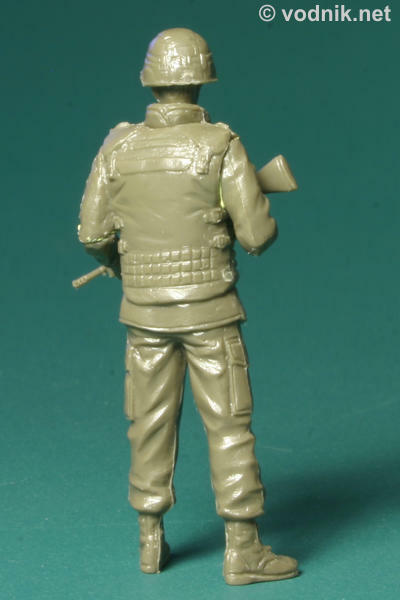 I assembled one of the figures (without using glue - just with some blue tac type clay) and noticed that while the fit of parts is relatively good, it is not perfect and some trimming would be necessary to remove gaps. It may also be necessary to use filler putty in some places. 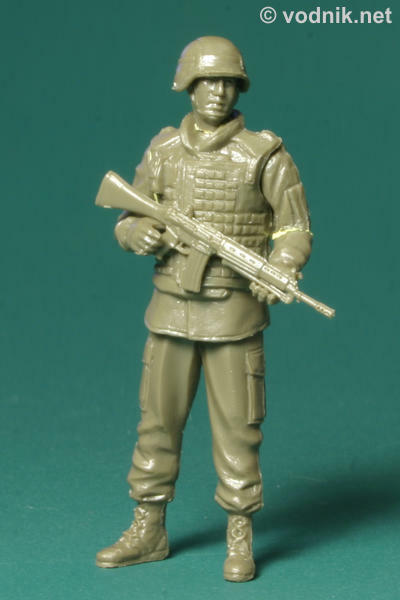 As is often the case with plastic figures, hands do not fit the weapon very well, so it requires careful fitting to achieve realistic results. Generally however the pose of the figure is quite natural and correct. Four views of one of the figures (without any smaller equipment parts attached). Two sides of 110mm anti-tank grenade launcher. Note small ejector pin marks. 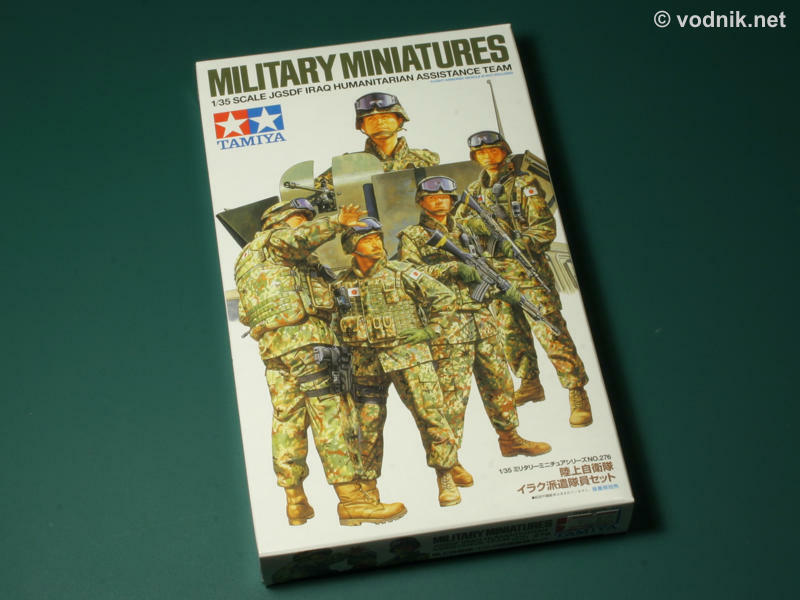 Up to this moment the JGSDF figure set seemed to deserve full recommendation, but things changed a bit when I put the Blast Models resin figure of US Marine soldier next to Tamiya figure. Okay, Japanese people are usually not very tall, but those figures seem to be slightly too small. 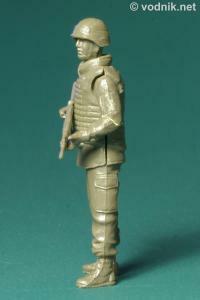 Blast Marine figure measures about 54mm, which is an equivalent of 189cm. He is rather tall guy, but nothing special really (I'm 188cm tall - it is about 6' 2"). Tamiya figure measures some 48mm - this would mean 168cm in real life (slightly above 5' 6") and it is rather skinny guy. 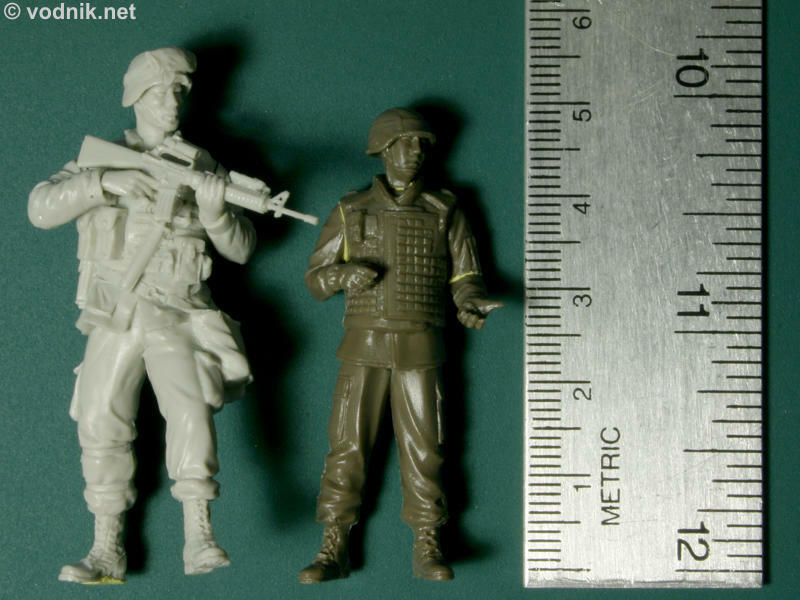 This means that while those figures are not really unnaturally small, they just look underscale when put next to average 1/35 figure (like resin figure from Blast, but also Dragon plastic figures). Comparison of size of Blast Models resin figure and Tamiya JGSDF plastic figure. 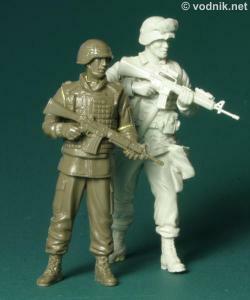 New Tamiya figures are very well sculpted and molded. Poses are natural and details of their equipment are crisply and accurately reproduced. Those figures would be a perfect addition to a diorama featuring Tamiya JGSDF LAV kit. The only problem is that you must be very careful if you plan to mix those figures with some other resin or plastic figures, as the size difference may create undesired caricature effect. Many thanks to RAINBOW TEN online store for their excellent service, which allowed me to write this review less then a week after set's release in Japan!